Today is the two-year anniversary of the Insecure Writer's Support Group hosted by the awesome and energetic Alex 'Ninja Captain' Cavanaugh. He has some exciting news, so hop on over to his blog. 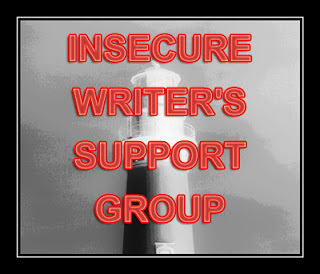 The IWSG group is all about people supporting each other and we know that writers can be neurotic, right? I know I am. I thought about sharing one of my neuroses today, but in view of the fact that this is supposed to be a celebration, I decided to do something different. While thinking about this earlier, I realized that it was around this time, two years ago too (happy coincidence, right?) that I started my self-publishing journey with Don't Get Mad...Get Even. It's now perma-free and was #2 when I checked just now. It's been number one both paid and free in the short story category on Amazon and has been in the top ten for more than a year. I'm sharing that because up to now it's kinda hard for me to believe that something like that could happen for an ordinary writer. That said, this is an EXCITING time to be a writer. I don't mean to shout, but these days the possibilities for a hard-working writer are endless. If you take the self-pubbing route, you'll basically be doing EVERYTHING for yourself, but with the support and encouragement from a host of writers, I've made a solid start down the road to having a sustainable career at something I LOVE doing. An aside here, I started on the traditional route and had to do a lot of work anyway when I didn't even know what I was supposed to be doing on the PR front. Now I know I shouldn't shout, but pardon me if I got carried away. It's wonderful to realize that with the assistance we have (PC, internet, helpful and selfless writers, affordable Marketing & PR machinery), we are guaranteed some level of success. So what are you waiting for? If you believe that writing is what you're supposed to be doing, get cracking! You may never find overwhelming fame or fortune, but you'll be happy as you follow your calling. As I like to say 'Unswerving perseverance is the key to success'. Do visit the other IWSG members here. It is an awesome time to be a writer! Congratulations on the success of that first self published book. And thanks for helping to take the IWSG to the next level. This is an EXCITING time to be a writer! Damn the torpedoes. Full speed ahead. And self pubbed writers are making it to the New York Times Best Sellers List too. Never have there been more opportunities for writers and we have to embrace every possibility. Also, WTG on supporting the IWSG website. We need great people like you to help keep such a big machine running. Go, Joy, Go! What an inspiration you have been and continue to be. The work you'll be doing to help Alex is awesome! And your post couldn't come at a more auspicious moment for me. Thanks. Great pep talk through personal experience. I've read DGMGE and it's good. Congratulations on your success! And thank you so much for the pep talk. I needed it. Sometimes I get my priorities mixed up. This post helps keep in mind what's important! Visiting with the IWSG, and I don't mean Gary!! Ha ha! If you don't know him, you should, Klahanie is his blog name and Penny is his wonderful dog! I'm so proud of you, Joy. That can only help your writing career. My short stories will be there soon. You inspire -- ME. I'm shouting, only one word. Joy, you are one of my shining examples in this process. You have been so smart about how you've gone about the self-publishing and then, above and beyond, you've been so generous sharing your learning curve with the rest of us. Thank you! I'm with Lisa. Thanks for the pep talk. It' so hard sometimes, it's always good to hear someone soldiering you on. Congrats on the success of your book and yes it is perceived that 'regular writers' shouldn't have this success. Everyone who wants to be a writer needs to put in the effort and have the dexterity to go to the finish line. Perseverance for the win! Thanks for the reminder that with some hard work and dedication, we can make a wonderful career for ourselves! Thanks, Alex and no worries. Glad to be a part of something worthwhile. So true, Stephen. I'm awed by what self-pubishers have done in so little time. True that, Diane. We do need to grab those opportunities. Isis, I'm blushing. Thanks for your support. Congrats on your upcoming release. Cool cover. Julie, thanks. I think we'll all benefit hugely when the site gets underway. Crystal, you made me smile. Thanks! Mike, I've been falling down on the visits. Coming over to see what you've been up to. Lisa, glad this post helped you. It's easy to lose sight of our goals with all the stuff we have to do. Will check out Gary and his dog. Peaches, thanks so much. Can't wait for your short stories! S.L., It is hard to keep going consistently, but as long as we have stories to tell, then we gotta keep moving forward. Thanks for sharing your thoughts. Sheena, yup, there no looking back once we start the process. Ya know, we all dream about being well-known for our writing, but slow and steady is what keeps readers reading. Shallee, OMG.It's been so long since I haven't done a HWC post. Still trying to stay on the wagon though. We do need some stick-to-it-iveness to stay the course. Thanks for pep talk, Joy. You did great and I'm happy with all you've achieved. As you say... no good reason not to write. Never has the time been more ripe! I love your positive attitude! Congrats on your success. Quite an encouraging post. So many things to celebrate. Congrats on your hard work paying off. I understand you've been anxiously waiting for one of my highly collectable comments n' stuff. Yes, it's me, Penny the Jack Russell dog and modest internet superstar aka Snoop Bloggy Dog. I'd like to say that you are true testimony to determination in having the passion that is your writing, fulfilled. Doing it your way and utilising all the resources on offer. I also note my adoring human fan, Lisa, has made mention that my human, Gary, who is deluded, probably insecure, thought "IWSG", actually does mean, "I Was Seeking Gary." I shall continue to humour the old dude. Well done to you and congrats on the second birthday of this group. I don't own enough hats to cover everything I do as a self-published author! It's hard work but satisfying. It really is amazing what we can do these days as self-publishers. The internet has made so many things available to us. And ebooks! This would be so much harder without ebooks! LOL, I'm worried that I'm the only person that thinks my writing is pretty good. Suppose I do all that work and effort and expense and nobody buys a single copy - or downloads for free. To me, that would be more depressing than a rejection letter. But, I don't have the marketing sensibilities to go along with the writer drive. I am please to see you have succeeded at your writing/publishing dream Joy. That took a lot of hard work and perserverance, and I hope your success continues for many years to come. Congratulations, Joy! And we're all there, rooting for you :). Robin, yes, it's a good time to do what we like. Christine, happy to oblige and yes, writers on a whole are awesome! Mina, glad to see you here. Challenging is a good word to use for all the ground we have to cover, but it's worth it when we look at our finished product. Watching for your release. Natasha, when we stop to think about it, we have much to celebrate. Wendy, I can definitely relate to what you've said. Rachel, so true. Many of us would not have gotten as far as we have without the wonderful www. Donna,you made me laugh. Ya know, I don't worry about my writing too much. Enough people have said positive things for me to believe that I can write good stories. The marketing thing is not among my favourite things to do, but I'm learning. Thanks for your good wishes. Elise, the changes in the publishing world has done so much for many who would not have found a platform otherwise. Hooray for growth and changes! Charmaine, I feel the same. Instant Messaging and apps like WhatsApp still amaze me. I love your attitude, Joy. Your joy and positive thinking is contagious. Best of luck on your career. I'm so happy to hear about your successes as a self-pubbed writer, Joy. You work so very hard. I love all the options available to us as writers right now. Woo hoo, Joy! I'm glad to hear you're doing well. You're a wonderful writer. And thanks so much on those tips on key words and blurbs recently. It was mega helpful. Hey, that is something to shout about. Your hard work has paid off! Thanks, Joylene. I think I'm mercurial by nature, but it's so much easier to be happy - not to mention uplifting - if I stay positive. Susan, yes, we have lots of avenues open to us these days. Lexa. Thanks. I resisted IWSG for a while, thinking I just didn't have time, but we make time to do what we want to do and IWSG has a great bunch of people. Mary, you're welcome. I need to take more of my own advice and finish doing the rest of my book blurbs. Joy, I say shout all you want! You rock! You've inspired me to keep on writing. Thank you for that. Glad you're staying on the train. Hooray for that! What a fantastic and inspiring post Joy and I am truly inspired. It was also two years ago that I met you and I am humbled to know not only talented writers like yourself but hardworkers too.